Waterhog Premier Mats are heavy-duty, commercial-grade Waterhog entry mats made for any environment. This waterhog floor mat boasts a diamond ridge surface pattern which is the most effective design for removing dirt and water from shoes. The rubber water dam border on the Waterhog Premier Entrance Mat holds moisture within its trenches and off of the floor. 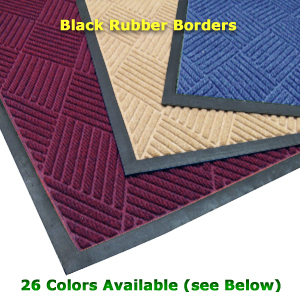 • The rubber-reinforced surface, borders and backing give these Waterhog Mats superior durability and longevity. • Waterhog Floor Mats contain an anti-static polypropylene fabric on their surface that dries quickly and will not fade or rot. • An ideal Waterhog Mat for moderate to high-traffic, indoor / outdoor areas. • Clean these Waterhog Door Mats by simply vacuuming, hosing off and hanging dry, or even extraction cleaning methods.